Huge Sphatika (crystal) Lingam on dais just beside Sage Adi Shankracharya's Samadhi in Kedarnath - Praying and receiving spiritual vibrations from Lingam in 2010-Himalayas. 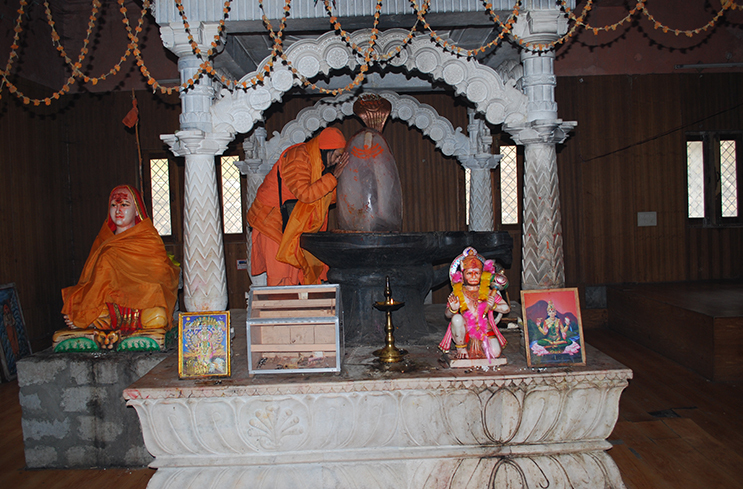 Adi Sankaracharya renovated the Kedarnath shrine in 2000 BC. Behind this shrine is Adi Sankaracharya’s own Samadhi which houses a Spathika ShivaLingam. Spathika ShivaLingam is basically a trigonal crystal, one part silicon and two parts oxygen. It has mysterious healing properties and removes all curses and negative karma. This Samadhi and ShivaLingam is a very sacred space. Shiva Lingam represents The Formless. Lingam is the outward symbol of the Formless Supreme Being, who is the indivisible, all-pervading, eternal, auspicious, immortal essence of this vast universe, and who is the undying soul in our hearts.